TO SYRIA IN BENGHAZI COVERUP! The Watergate Coverup was our biggest White House Coverup until now, that we really know about and there are definitely some Coverups that we do not know about, but this Crime is not the Crime itself. The real Crime is the Massive Coverup. The big difference in the Watergate Massive Coverup and the BenghaziGate Massive Coverup is that Four Americans died in the BenghaziGate Massive Coverup. Although we have had some recent Whistle-Blowers in the BenghaziGate Coverup, there is no surprise that no real answers have been turned up and nobody has been accuced of any wrong-doing. It’s basically Lie after Lie after Lie. The really sad thing about this Secondary BenghaziGate Coverup is that most of the American People are still not aware of the Obama Gun-Running Operation that either went bad on purpose or by accident. Either way, the American People are still unaware and still un-informed about the the Gun-Running Operation. The Morons or “Low-Information” voters do not care, but to the American People, this Gun-Running Operation and Massive BenghaziGate Coverup is what got our four brave Americans killed after Obama gave the Order to Stand-Down. We have found out, however, that the Obama Administration Deleted State Department Memos From the Internet After Discovering that Al-Qaeda Was Behind the Benghazi Consulate Attack that killed our four Americans! Let me be clear about what I am about to say. Obama and his Criminal White House Staff are still going on with Thugery Business in the White House and they know that Congress will NEVER get to the bottom of the BenghaziGate Murders and the Obama Gun-Running Operation. Obama actually dares anyone in Congress to even question him about it. All of the White House and White House Aids are all still covering for Obama and Hillary and while everyone is covering for them, both Obama and Hillary were secretly trying to pass a United Nations Gun Bill that would take all of our guns away from us and if then if we resist to the Gun-Grab, Homeland Security, who recently purchased 450 Million Hollow Point Bullets will kill us if we resist. For your information, Hollow Point Bullets are used to KILL people. They are not used to wound people, because they explode on impact. Obama won the Election by VoterFraud, in a VoterFraudGate Coverup, and he is using his Obama Czars to write policy and make changes to our Constitution and then Obama is passing them with Executive Orders with the stroke of a pen. King Obama still dares our Congress to question him on any of this and the Spineless Congress is letting him get away with it, just like in the Massive BenghaziGate Coverup and FastAndFuriousGate Coverup. Here are some shocking facts that have not been brought up for fear of hurting King Obama, David Axelrod, Eric Holder, and Hillary Clinton. Obama and the White House are still trying to hide something in the “Real Benghazi Coverup” that can not get out to the American People? The truth is that King Obama and our United States Congress had a “Gun-Running Operation” to the Syrian and Lybian Terrorists. The big question right now: was it done legally or illegally? If it was done legally, then there are eight congressmen, four Dems and four GOP, who knew about it. If it was done, illegally, then we need to know who authorized it. If it was done legally, then Senator Diane Feinstein knew all about it and if it was done illegally, then she needed to know about it. Either way, these United States Congressmen are politically motivated to keep it quiet, but by doing so, they are committing Treason to the highest degree. Side Note: Diane Feinstein fights Congress and the American People to Grab Our Guns, but then works hard in helping to supply the Lybian and Syrian Terrorists with Massive Guns to fight America and the Al-Qaeda Terrorists. A few months before the Benghazi Massacre, the New York Times reported that our CIA had been working with Lybia and Turkey in Running-Guns to the Syrian Terrorist Rebels. 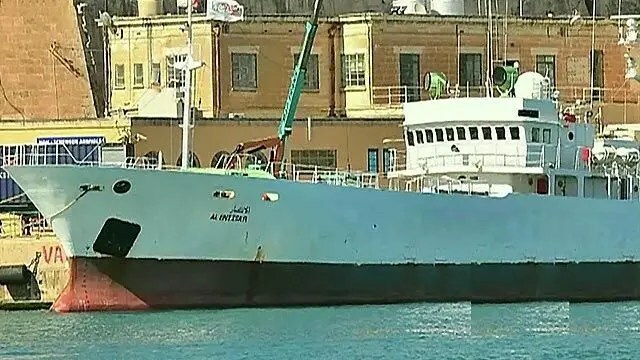 There also was a ship, The Lutfallah II, that sailed from America to Turkey with 400 Tons of Weapons on the ship to give to the Muslim Brotherhood who supplied them to the Syrian Rebels. When we were talking about FastAndFuriousGate, we were talking about King Obama and Eric Holder giving away or selling guns to the Mexican Mafia to kill Americans and Mexicans, with the intention and goal that the Obama White House could shock the American People and then demand to Ban all of our Guns and this is still their plan for the Obama Second Term. With this ship sailing to Turkey, with 400 Tons of Guns, we’re talking about a FastAndFurious situation that is 1,000 times worse than the original FastAndFurious. If the American People found out that these guns that were used in the Benghazi Terrorist Attack were supplied by our own CIA, I believe that King Obama would have a few questions that he could not answer, although he and Holder would continue to lie and lie and lie. Also, from very reliable sources, Obama had 13 reports on his desk on the morning after the Terrorist Attack and not one single report had anything about an anti-Muhammed video that caused the Benghazi Attack. So the bottom line is that Obama and our CIA supplied all of the guns to the Syrian and Lybian Terrorists that killed our four Americans. And the sad thing is that all of the dead people and alive people that voted for Obama are getting Free Food, Free Housing, and Free Phones, and they do not care if Obama lies or kills, as long as they continue to get their Food, Housing, and Phones. One more piece of information that has been uncovered is that Sean Smith sent numerous emails out that stated that he was in “Huge Danger” and if he did not make it back home, for us to check-out the “Lybian Police” that were guarding him. Still another piece of shocking information about Obama and the White House is that Russia is now reporting that The Muslim Brotherhood has several of our Stinger Missiles. Since we still are using The Muslim Brotherhood to arm the Syrian Rebels, do not be surprised if they are not used on us in the future. All of this sounds like an episode of NCIS or NCIS-LA, but in those stories, we always have the great NCIS Agents to foil the Terrorists, but in this current story, we do not. President Richard Nixon was not impeached in Watergate for the Crime, but he was impeached because of the Massive Watergate Coverup. This is one reason why Obama let Ambassador Chris Stevens and NAVY SEAL Ty Woods and Navy Seal Glen Doherty die, because Obama, Holder, Axelrod, and the White House did not want the American People to find out that the Syrian Terrorists were using our guns to kill our own American People. Charles Woods also described his brief encounter with President Obama during the ceremony for the Libya victims. “Even at the graveside funeral for Ty and Glen, Mr. Obama would not look at me straight in the face. The CIA Timeline shows that everyone knew that Ty was asking for help and that he did not get it,” Woods further stated to Hannity. My personal opinion is that Obama is faking his outrage over the four dead Americans, because he is trying to hide something and he then will always change the subject. In Conclusion, we now know that Obama and the White House are still hiding a Massive Coverup and this Massive Coverup that they are hiding is bigger than the BenghaziGate Coverup and many times greater than The Watergate Coverup.